To measure temperature accurately, we have to use a thermometer, which makes use of thermometric substances. Thermometric substances: substances (solid, liquid or gas) that have physical properties that vary continuously and linearly with temperature. Immerse the bulb of the thermometer into a funnel containing pure melting ice at one atmospheric pressure. Insert the thermometer into the apparatus such that the bulb should be just above the boiling water at one atmospheric pressure. When the mercury level in the thermometer stem remains steady, make a mark l100 at that level on the stem. This is the steam point. Fixed point is the standard degree of hotness or coldness such as a melting or boiling point of a substance. Ice point is the temperature of pure melting ice at one atmospheric pressure and has a value of 0⁰C. 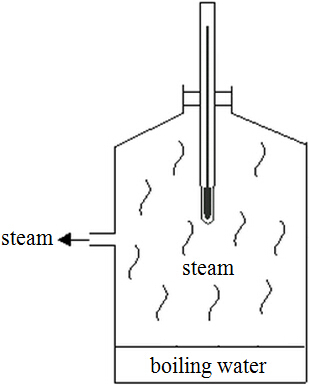 Steam point is the temperature of steam from pure water boiling at one atmospheric pressure and has a value of 100⁰C. 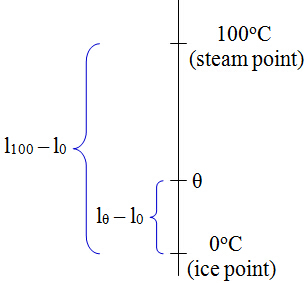 Step 2: Divide the interval between ice point and steam point into a 100 equal parts. Each interval is 1⁰C. Once the Celsius scale is determined from above, we can simply place the calibrated thermometer into the unknown substance and get the reading. This equation can be applied in any thermometric properties discussed previously. Note that Tupper - Tlower is ﻿not always 100⁰C﻿. 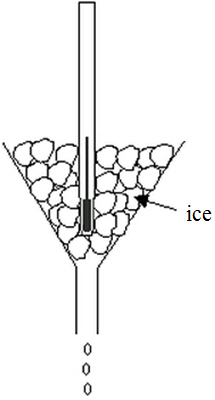 A thermocouple indicates 0.1 mV at ice point and 2.6 mV at 500⁰C. What will be the temperature when the thermocouple indicates 3.0 mV?